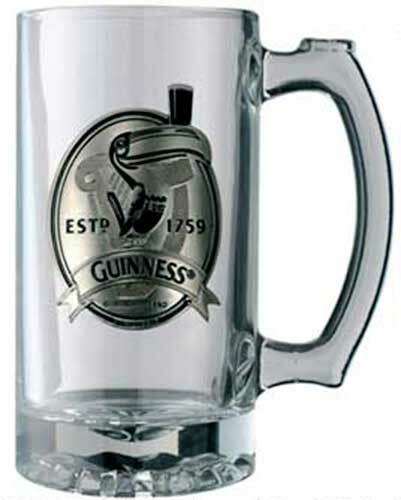 This glass Guinness mug features the harp logo with the famous Gilroy designed toucan superimposed on the embossed pewter emblem. The toucan is naturally depicted with its ubiquitous pint of Guinness on its bill and stands between the 1759 established date of the brewery located at St. James' Gate in Dublin, Ireland. This 16 ounce Guinness tankard is received gift boxed, complements of The Irish Gift House.